1st issue Providence Police badge, circa 1845. Photo courtesy of John Glancy PPD Capt. Retired. 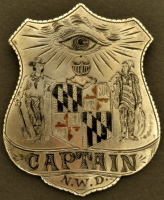 3rd issue Providence Police Captain's badge, circa 1882. This style badge was used up until 1948. Cabinet photo of a Captain, Providence Police, circa 1900. Photo courtesy of John Glancy PPD Capt. Retired. 3rd issue Providence Police Lieutenant's badge, circa 1882. This style badge was used up until 1948. 3rd issue Providence Police Sergeant's badge, circa 1882. This style badge was used up until 1948. 3rd issue Providence Police officers badge, circa 1882. This style badge was used up until 1948. 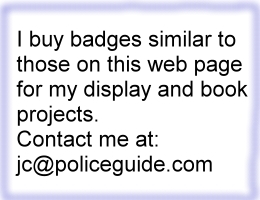 Providence Police Constable badge #2651. 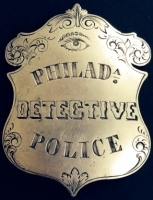 1st issue New Port police badge, circa 1860.